Vinko is a little ­fish who lives in a lake at the headwaters of the beautiful National Park of Plitvicka. It is a fi­ne place to live, but Vinko is a curious little ­fish and he wants excitement! Some days, Vinko and his friend Bruno swim near the waterfall that leads to the pond below and wonder what would happen if they swam over it. One day, Vinko and Bruno swim so close to the waterfall that they can’t get out of the current. Sloop! Over the falls they go. Vinko must summon all his courage to survive the adventures that lie ahead and search for a home of his own. 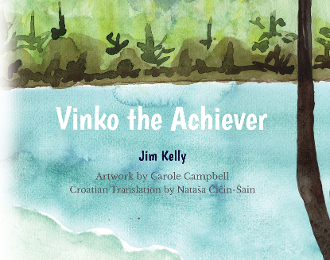 Inspired by the true story of Vinko Biskupic, Jim Kelly’s story and Carole Campbell’s watercolors combine to motivate readers of all ages to become achievers. The translation of the story into Croatian, by Nataša Cicin-Šain, is a special treat for those interested in learning the language or those who wish to experience it in their native tongue.